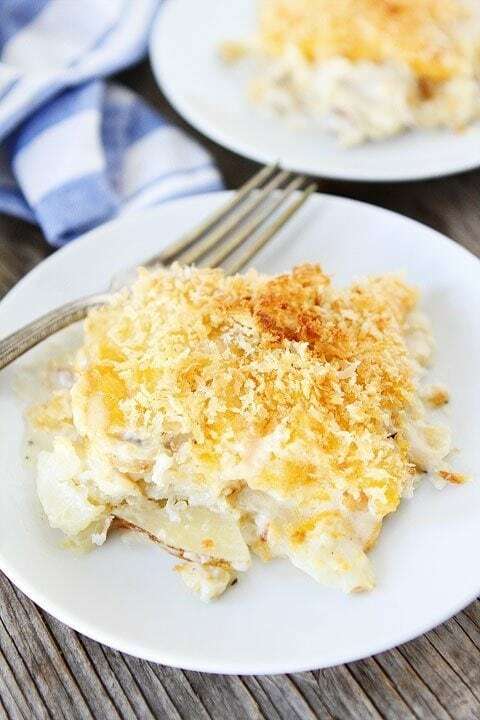 Parmesan Crusted Scalloped Potatoes-cheesy and creamy layered potatoes with a crispy Parmesan panko crust! 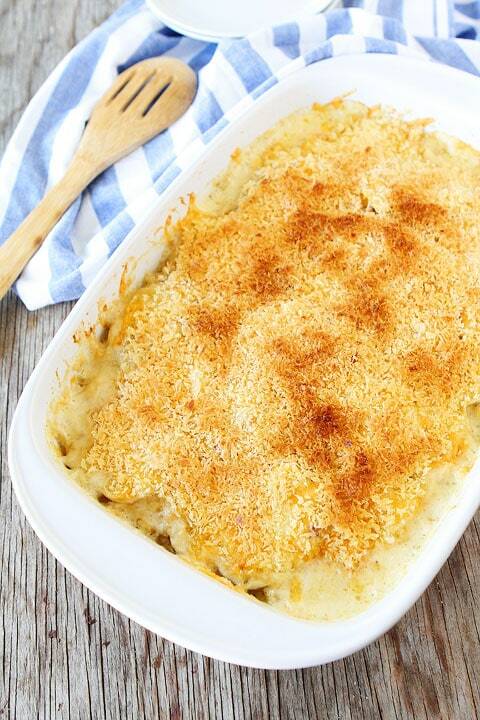 These Cheesy Scalloped potatoes are a great side dish for any meal! After Josh and I got married, we moved into a small apartment for a few months while we were house hunting. When we were unpacking boxes in the kitchen, I came across Josh’s kitchen box. He had a lot of the basics: spices, flour, sugar, canned food, etc. I also found a few boxes of scalloped potatoes. I was intrigued. My dad grew up on a farm in Idaho, so we never had boxed potatoes growing up. Potatoes didn’t belong in a box:) I asked Josh why he had several boxes of scalloped potatoes and he got super excited. He said they were his favorite and asked if he could make a box for lunch. I just looked at him with a blank stare. He couldn’t be serious. Oh, he was. He dug through more boxes to find some pans and he made the boxed scalloped potatoes for lunch. I humored Josh and took a bite, but I let him enjoy the rest. I was not a fan of his favorite boxed scalloped potatoes. I told him from now on we can start making REAL scalloped potatoes:) Well, Josh must really love me because he never bought boxed scalloped potatoes again. He created a scalloped potato recipe, from scratch. And I have to say Josh’s Parmesan Crusted Scalloped Potatoes are the BEST scalloped potatoes I have ever tasted. He may have got his inspiration from a box, but his scalloped potatoes are the real deal! They are SO good! I asked Josh the secret to his scalloped potatoes and he said lots of cream and lots of cheese. No wonder they are so good:) He also adds a Parmesan panko topping to the scalloped potatoes. I LOVE the crispy cheesy topping. It really makes the potatoes extra special. Josh makes his Parmesan Crusted Scalloped Potatoes every Easter. It is tradition at our house. We are all counting down the days until Easter so we can dive into a big pan of Josh’s creamy and dreamy scalloped potatoes. Add Parmesan Crusted Scalloped Potatoes to your Easter menu! They are a great side dish, but beware, they might steal the show and be the highlight of the meal. Layers of creamy, cheesy potatoes with a crispy Parmesan panko crust. This is Josh's famous recipe! Everyone loves these cheesy scalloped potatoes! In a large pot, melt the butter over medium-high heat. Add the onions and saute until translucent and softened. Add the garlic and continue cooking for another minute. Stir in the cream and vegetable broth. Season with the salt and pepper. Add the potatoes and bring to a boil. Reduce to a simmer. Continue cooking until the potatoes are tender. Poke with a fork to check. This should take about 10-15 minutes. Transfer half of the potatoes and cream mixture to a greased 9 x 13 pan. Sprinkle half of the cheeses evenly over the potatoes. Layer the rest of the potatoes over the cheese. Sprinkle remaining cheese over the second layer of potatoes. Make the Parmesan Panko topping. In a small bowl, combine melted butter, Panko bread crumbs, and Parmesan cheese. Stir to combine. 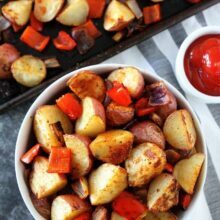 Sprinkle topping over the potatoes. Bake potatoes until bubbly and the top begins to brown, 20-25 minutes. Remove from the oven and let sit for 10 minutes. Serve warm. YUM! 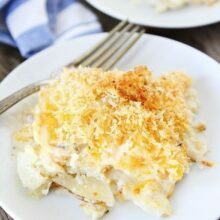 I adore scalloped potatoes….especially with 3 kinds of cheese! Yum! This recipe reminds me a lot of the French potato dish, gratin dauphinois, that my mom used to make for special occasions! It also involves lots of cream and cheese and it’s nice to see that this recipe doesn’t shy away from the good stuff! I third that Yum! This is truly a special occasion recipe. These look amazing! I love all the cheese! What a comforting-looking casserole! I love scalloped potatoes and I would definitely not wait for special occasion to make these! 😉 pinned. I LOVE that these have 3 kinds of cheese Maria!! I’m on a huge gruyere kick lately! I need to make these! Total comfort food deliciousness 🙂 Mmm! Tell Josh to keep those potatoes coming! Scalloped potatoes are always welcome on my table! Perfect comfort food. They would be great with ham this Easter. Mmmm….parmesan and potatoes are my weakness!! Love this! Potatoes, parm, panko – LOVE this!! Making me so hungry! these are just exactly what I want on my Easter table- they look so good!! Scalloped potatoes are my faaaaaav. Loving that parmesan topping! I was raised on a farm and did not know what was ‘packaged’ scalloped potatoes at the time until I met my husband 🙂 I did the same thing, I made him real scalloped potatoes. He loved them. Thanks for sharing your recipe! Yum! Perfect side dish for my Easter ham. Oh man! Creamy cheesy potatoes are my weakness! This looks great! Pinning! There’s nothing better with an Easter ham than scalloped potatoes! 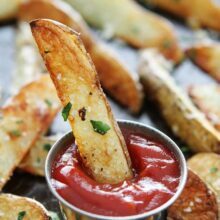 These look so cheesy and perfect for dishing up on the side! OMG my mouth is watering. I am making this for dinner tonight dinner tonight. Just in time for Easter and so delicious! These just blew traditional scalloped potatoes out of the water completely! One heck of a side dish. All my favorites into one little dish. I am so loving that crispy topping, Maria! The real deal is so much better than the box. I bet Josh is never looking back now that he has a pan of homemade scalloped potatoes. Love the panko topping. Scalloped potatoes are one of my all time favorite foods and this version looks soooooo good! I love the panko topping; that has got to just take these over the top. I know its probably not the same, but can you use 2% milk instead of cream to keep the fat content down? Although my husband loves potatoes, he’s not a big fan of Gruyere. Is there another cheese that would be a suitable substitute? Wowza! These potatoes! And that parm panko topping! This looks so decadent and tasty. 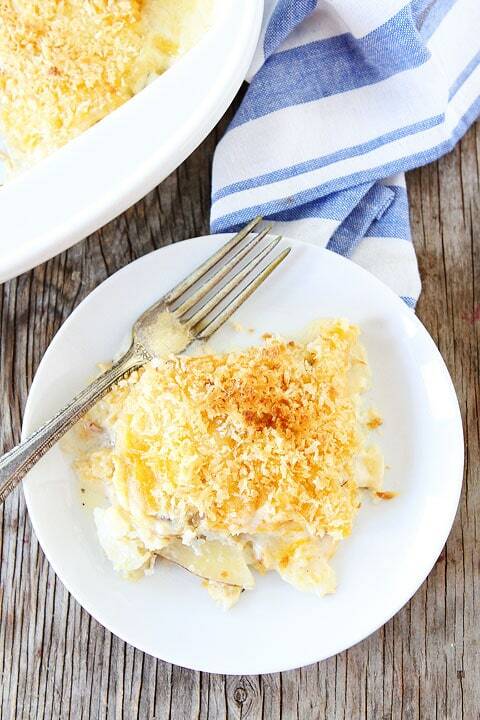 Wow, how can you go wrong with scalloped potatoes and crispy parmesan topping?! YUM!! I never would have thought to actually cook the potatoes in the sauce! This is a brilliant idea and looks like a great recipe — thanks! I made these tonight and my husband said they were the best scalloped potatoes he ever had. My daughter couldn’t stop eating them. I cut the cream to 1/4 cup and 1/4 cup low fat milk. I upped the broth (I used chicken broth). I used 1 Tb butter for the potatoes and 1Tb butter for the topping. It was still amazing! We didn’t miss that extra fat. Yay! I am so glad you liked them! 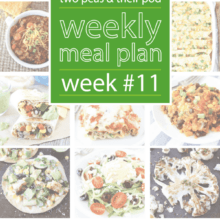 I just made these last night for dinner and they are delicious! I was out of Panko so I used ground up pita chips from Trader Joes and they were fantastic! These sound awesome to me…you just can’t beat a good pan of scalloped potatoes! My brother was always a huge fan of the boxed potatoes. I was never sold. These look fabulous. I can see where it would be hard to just have a small portion. Could I make these a day I’m advance? This recipe was perfectly timed. My husband has been asking me to make scalloped potatoes and when I saw this recipe I knew he’d love it. I was right, he can’t get enough of this. Thank you so much. It’s the best scalloped potato dish I’ve ever had. I have them in the oven now! I did sub Monterey Jack because that’s what I had. I’m anxious to see if my picky eater daughter will eat them. I always make mashed to go with our roasts…she’s not fond of change! I haven’t tried putting them in the fridge unbaked, but they reheat really well. They would probably be fine unbaked too, I just haven’t tried it. Let me know if you do! Happy Easter! Made these for Easter with RAVE reviews! The only thing I did to make it easier was peel and cut the potatoes the day before. Also prepped the onion and garlic. Left potatoes in fridge in water overnight and continued the next day. A huge thank you for this recipe! Made these for our Easter dinner and OMG delicious!! They were the talk and outshined everything (just as you said)! They will be a perment dish on our future Easter menu and many more!! Thank you for sharing!! Every recipe of your I’ve tried exceed all my expectations!! Made these for Easter dinner…. Simply Delicious!! I made these yesterday for Easter supper. I used 2% milk instead of heavy cream. My family had seconds, so they were a hit! These were perfect! THE best scalloped potato recipe I’ve made! Went very well with Easter dinner… Garlic and herb roasted leg of lamb. Thank you for sharing! You are very welcome! Glad you liked the potatoes! I am making this for a dinner party tomorrow night. Do you think I could put together in the morning, and then bake in the evening? Thanks for this yummy recipe! can these be partially made the night before big party??? Yes, you can make them the night before and put in the fridge. Bake the next day! I have been looking a long time for a recipe that made me say “YUM”. Spotted this one today and had to try it. I LOVE TO COOK. I want to thank your husband for creating this recipe as it was simply delicious and exactly what I was looking for. I did, however, use Mild Cheddar and Italian Blend shredded cheeses. My husband loved it too. Made these tonight. My dad is going through a rough time and loves scalloped potatoes so I made them as part of our meal tonight. He adored them, we all did. They were so good. This recipe will definitely be a new family favourite. Thanks for sharing. I read the title and was like “no”, then read the post and was like “yes”. Excited to make this on the weekend!! Yum! I love potatoes and parmesan! Hi…love you guys and your recipes, but have to say after making this recipe twice (exactly)…it’s a runny, somewhat greasy mess? Are you sure 2 lbs of potatoes are enough? It’s tasty for sure…I mean how can you go wrong with those 3 yummy cheeses…but it doesn’t “set” like scalloped potatoes should…help? Hmmm, we’ve never had a problem with the recipe. You can try adding more potatoes. Sorry you are having issues! Maria and Josh, Yum! What a great twist on scalloped potatoes. My wife and I loved them. I hope you don’t mind, I added some bacon bits under the parmesan and it was delicious. Thank you for sharing. Took them to church for a potluck supper. Got many raves and request for recipe. Took them a couple weeks later to Easter dinner. Again, same response. May it almost exactly like the recipe except for using chicken broth – low sodium. I made these for Easter and they turned out perfectly and are the best scalloped potatoes I have ever made or tasted, everyone else agreed too! Just want to clarify that you boil the potatoes in the broth and cream? Was afraid I was reading that incorrectly. Thanks, they look delish! Just wanted to be sure I was reading the directions correctly. You boil the broth and cream with the potatoes? Was afraid of boiling the cream? Thanks!! Looks delish! Yes, that is correct. Enjoy! Do I need to peel the potatoes or is it OK to leave the skin on? I’m making a batch for a holiday party and want to make sure I do it perfectly. 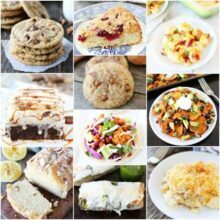 PS: I’ve been using your archive of cookie recipes for years and love to refer people to your blog! Thank you for always publishing such well-tested recipes. We don’t peel the potatoes, but if skins bug you, you can peel them. I am so glad you are enjoying our recipes and thanks for sharing with others!